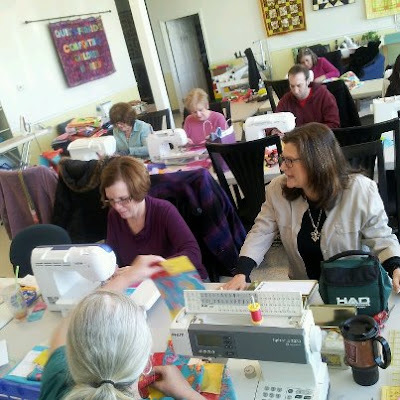 On Saturday March 23 we went to Quilts For Kids (QFK) in Fairless Hills, to stitch quilts destined for children who are hospitalized and in need of a little comfort and cheer. What a fun day we had! The very organized folks at QFK had kits all ready for us with pieces perfectly cut and color coordinated so all we had to do was set up our machines and get stitching. We all worked on the same quilt block motif but every quilt was different due to the variety of fabric choices. Here we are in the sweatshop, I mean, workroom. That's Linda Arye the founder of QFK talking while Kathy concentrates on her stitching. After a few hours stitching we took a little break for lunch and power socializing, and then it was back to the machines. We got the tops pieced and the quilts sandwiched for some machine quilting, and a few over achievers even got their quilting done. But we all took our quilt home to finish up the quilting and binding. So we hope to see them back at our monthly meeting to collect to return the finished quilts to QFK. We are lucky that Stephanie lives nearby so will be our deliverer when we finish them up. We were delighted that Stephanie's husband and daughter stopped by for a quick visit! Nice to meet the family! Speaking of meeting, while we were there a mother and four year old son stopped in just to say hello and see what QFKs is all about. Turns out he is actually a patient at a local hospital so after he and his mom toured the workroom, Linda had him choose a quilt to take with him next time he has to go in. He chose a John Deere motif quilt and was really excited to get it! We felt privileged to see his joy! Here's Janet's X and Cross quilt - recognize the block? We had a swap of these blocks last year. Aren't they great! This is a good I-Spy quilt. Tricia made this one, designed to meet the QFK's call for quilts that would be great for boys. Just look at the border with the dogs interspersed. Very clever and sure to be loved. Bobbi made this one from a charm square packet, kind of an I-Spy also, with a happy gingham sashing. Linda Arye and Nancy Haddad of QFK were so pleased to host us and hope we will have a return trip. We were nine (including two guests!) and the room can accommodate many more so if we do it again, perhaps even more of us can participate. We had a great time and felt good at the end of the day!